A suspect is dead and an auto parts store was damaged by a flying tire in the wild ending to a police pursuit Wednesday morning in Garland. GARLAND, Texas – A suspect in a drug complaint was killed and a bystander was hit by a wayward car tire in a crash that ended a police pursuit Wednesday morning in Garland. Police identified the suspect as 31-year-old, Jamarese DeAngelo Coleman. The incident began around 11 a.m., when Garland officers arrived at a home on the 1500 block of Kingsbridge Drive in the northern portion of the city. A person inside the home went out the back door and left the scene in a red Dodge SUV, police said. A roughly two-mile police pursuit down three major thoroughfares ensued, ending with a crash in the intersection of Shiloh Road and Belt Line. The fleeing suspect, Coleman, ran a red light and was hit by another car. He was ejected from the SUV, police say, and a tire that came off of the vehicle flew through the window of a nearby AutoZone. 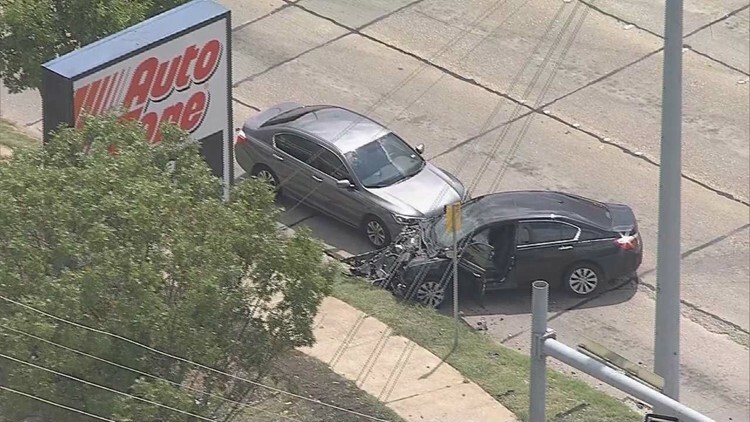 A customer inside the store was hit by the tire and taken to the hospital, where they’re expected to be OK.
Vehicles involved in a crash that ended a police pursuit Wednesday morning in Garland. Coleman was taken to a Plano hospital where he died. The driver of the passenger car that struck the suspect’s vehicle was taken to a hospital with “minor” injuries. Police said an undisclosed amount of marijuana was found inside the suspect’s SUV. Officers had originally been called to the home on Kingsbridge to investigate a narcotics complaint. No other details were available as this is an ongoing investigation.